If you're an executive eyeing an HP EliteBook Folio 1020 G1, you may want to hold out. HP's new EliteBook 705 G3 is a mid-range commercial-class notebook that's slim, sleek and light. The 700 series delivers many of the key features that are found on the 1000 series, but comes packed with added features that may make it a better value to business users. HP is marketing the EliteBook 705 G3 is the thinnest and lightest commercial notebook. The notebook meassures just 0.74 inches (18.9mm) thick and weighs just 2.78 pounds (1.26kg). The 705 G3 will be available in three sizes: 12-, 14-, and 15-inch screen options. Unlike the EliteBook Folio 1020 G1, which is equipped with Intel's more power conservative first-generation Core M processor, the new EliteBook 705 G3 comes with a more powerful AMD A12 APU integrated with R7 Radeon graphics. Like the premium EliteBook 1020 G1, the 705 G3 is made rugged tough for work. The 705 uses a magnesium and aluminum alloy for the lid and keyboard deck. To keep costs low, the undercarriage is still constructed from magnesium. HP's Premium Keyboard, taken from the 1020, is brought to the 705, said Alex Cho, Vice President and General Manager of HP's Commercial PC business. This means you get the same keys and the same key travel. The keyboard is also backlit for work in dim or dark environments. The keyboard is spill-resistant, and HP said that drop testing has been performed on the 705.
Business users will also appreciate the dual-cursor control system. In addition to the glass trackpad and dedicated click buttons, there is also a trackpoint. Unlike consumer PCs where HP's partnership with audio powerhouse Bang & Olufsen is used to drive more powerful speakers, the B&O partnership is used for microphone support, perfect for conference calls. One of the highlights about the 705 is that the screen can tilt up to 150 degrees, compared to 130 degrees for other notebooks. The 12- and 15-inch notebooks come with 1080p screens, and HP is adding a QHD option to the 14-inch configuration. HP includes a number of full-size ports on its EliteBook 705 G3. The notebook is the first in HP's business portfolio with support for the new USB-C standard. Additionally, there is a slim docking port, Ethernet port, DisplayPort and VGA port. For security, there is an optional fingerprint reader and TPM support. 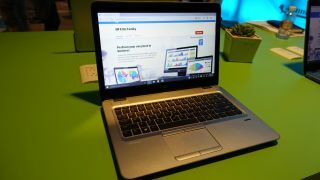 The EliteBook 705 G3 will become availabile in Spetember starting at $749 (£464, AU$1,007).